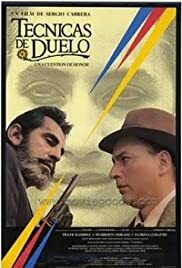 New Franchise Media Believes In "A Matter Of Honour"
The action takes place in a small town in the Andes, as news spreads across town that the mild-mannered local schoolteacher and the local butcher are going to have a duel this afternoon. The filmmakers use this event as a weapon with which to skewer Latin machismo and the strict, old-fashioned code of honor by which these people live. It is never made clear why they are duelling or who challenged who, and neither man wants to fight the duel, but they both feel obligated because it's "a question of honor." As the morning progresses, both men go about trying to put their affairs in order in case they die, sometimes hilariously (the schoolteacher gets stuck at City Hall all morning, trying to pay debts on his own future death, thanks to red tape). There are some other nice potshots at the hipocrisy of the Catholic Church (the local priest offers the butcher more salvation the more money he is given, and roots for the schoolteacher to be killed because he is an atheist) and the local political system (the mayor, rather than stopping the duel, takes bets on it). All in all, this is a very funny and meaningful film, that anyone would enjoy. Try not to have a smile on your face as the duel plays itself out.